One of the highlights of last month’s KTI visit to Northern France was a trip to the ancient town of Bayeux, just south of the 1944 landing beaches in Normandy. As Bayeux was liberated by allied forces very shortly after the offensive began, it was spared the devastation of bombing and shelling that effectively destroyed so many other historic towns in the region. Hence it really is a ‘must’ on the list for visitors to the area to see. Bayeux is, of course, most famous for its Tapestry, sewn in the Norman court shortly after the invasion and conquest of England in 1066. 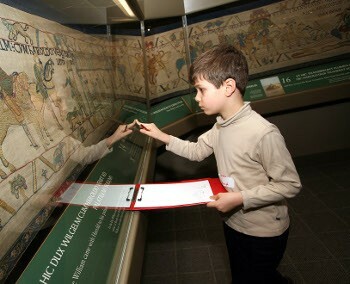 230 feet long, the Bayeux Tapestry is now housed in an elegantly simple museum in the centre of the town. A constant stream of visitors walk slowly along inspecting the nearly 1,000-year-old embroidered documentary about the origins and conduct of the Battle of Hastings – one of the most formative events in the entire history of the English-speaking peoples of the world. Leaving there, we headed to the edge of town to pay our respects at the British war cemetery and to visit the nearby museum to the 1944 Battle of Normandy. A pair of iconic American Sherman Tanks guard the entrance. Inside, the brave men of all the armies involved are remembered, with an extensive range of their equipment on show. Above, one of many life-size tableaux depicts a Polish soldier and an American GI meeting in the ruins of a shattered Normandy town. While the landings themselves were carried out by American, British and Canadian divisions, the Poles fought with particular heroism to close the Falaise Pocket at the end of the Battle of Normandy. Gun enthusiasts will particularly appreciate the manikin of the German soldier with his MP43/44 assault rifle. This was the ancestor of the famous Russian AK-47, and hence of all modern assault rifles. Finally, no visit to Bayeux is complete without going to the stunning Norman Cathedral. We marvelled at the architecture, pondered on how fortunate it is that this House of God survived such a terrible war, and prayed that it may also survive the one to come, as Christendom resists the Islamist assault that will be God’s way of bringing His lost children home.